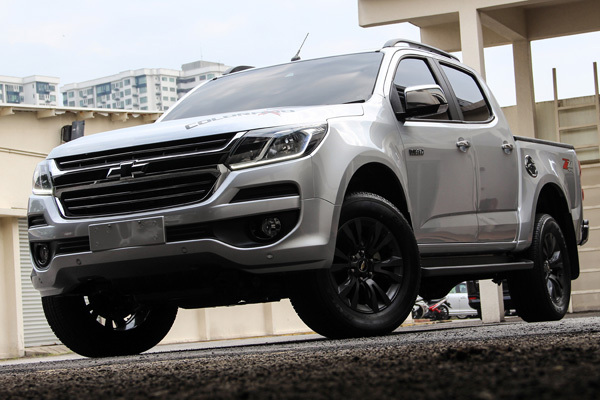 Petaling Jaya (10 August 2017) — Following the successful launch of the All-New Chevrolet Colorado into the Malaysian market in October last year, Naza Quest Sdn Bhd, the sole distributor and importer of Chevrolet vehicles in Malaysia, today introduces the X Edition consisting of three new variants of the popular pick-up truck: The Colorado X, Colorado X-Urban and Colorado XADV. “It has been a while since we launched the new Colorado late last year in 2016 and we would like to add more vibrant and wider options for the consumer to choose from. 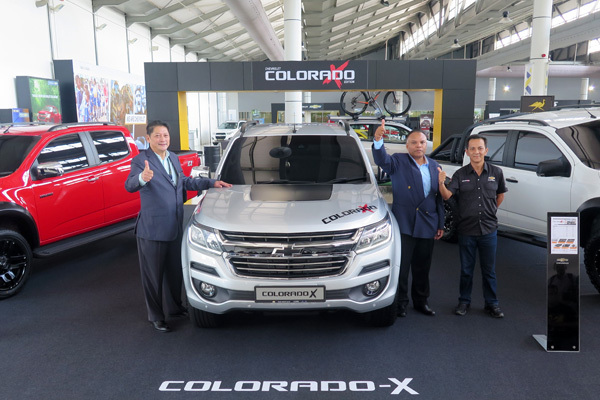 This new variant shows how sleek or rugged the standard Colorado can become” said Farid Rosli, Vice President 1, Naza Quest Sdn. Bhd. The concept of X Edition originates from the earlier fully suit up All-New Colorado concept truck which have been seen on display at every Chevrolet’s recent launch and roadshows. It came to no surprise that the Colorado concept truck caught most of the attention and inadvertently became a crowd-puller. A fully suit up concept truck however may come on too strong and extreme for one’s liking, thus Naza Quest have established 3 new variants based on 3 different lifestyle profiles which best tailored for each of the X Edition mainly; Colorado X for exuberant who just wants to spice things up a little, urbanites for the X-Urban & lastly X-ADV for the extreme thrill seekers. 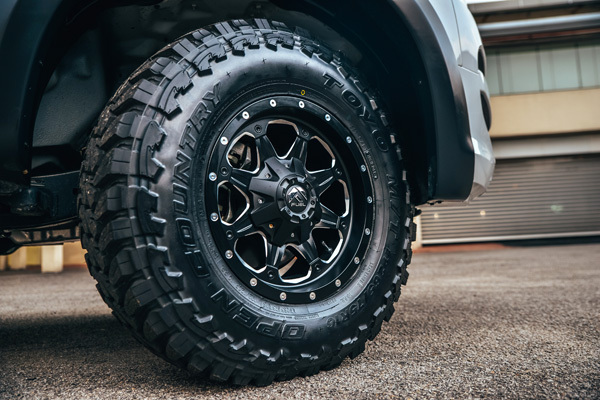 The three new variants (Colorado X, Colorado X-Urban and Colorado X-ADV) offers extra aesthetics over the standard model whilst still retaining its tough yet refined appearance. The Colorado X Edition accentuates black as its identity that speaks elegance, giving the overall pickup truck a strong aspect of robust and toughness, communicates power, strength and prestige. The Colorado X, coming in as entry-level from the X Edition will see new sophisticated Black Emblems replacing the current Golden Bowtie both at the front and the rear tailgate, X-brand Hood & Bed Liner Decal, Black Hood Decal, Black Chrome Fuel Cover, Black Tailgate Decal with enlarged ‘COLORADO’ branding and lastly Black Coated Rims at selling price from RM113,248.28 onwards. 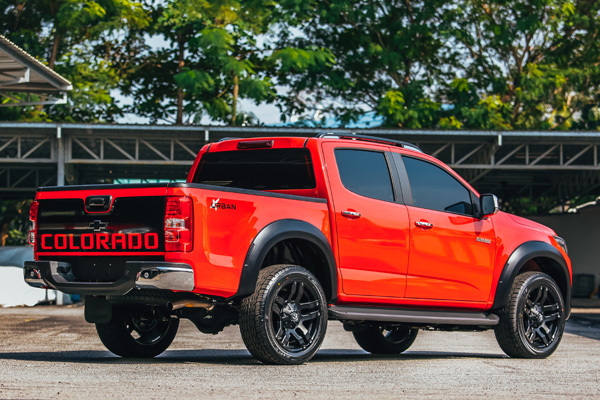 The Colorado X-Urban selling from RM131,798.28 gets all the extra aesthetics of the Colorado X with addition of 20-inch Black Fuel Rims with Rim Cone, HT Tyres & Black Fender Flares. Finally the Colorado X-ADV, which also get all the extra aesthetics of the Colorado X, comes with new Sport Bar, 16-inch Black Fuel Rims, Mud Terrain Tyres, Black Side Step, Black Fender Flares, Black Paint Job on the Front Grille Panel, Rear Bumper, Side Mirrors & Door Handles, and lastly Old Man Emu 4×4 Suspension System from RM145,578.28. Given that the XADV caters mostly to outdoor adventurer, instead of offering a compilation of parts chosen primarily to increase the truck’s ride height, OME 4×4 Suspension provides a range of tuned and matched integrated systems, each offering optimum levels of comfort and noticeable improvements to the truck’s performance including load carrying capability and control characteristics. All three new variant are equipped with an upgraded 2.5L Duramax four-cylinder turbo-diesel engine that features a Variable Geometry Turbocharger (VGT). The Euro-4 compliant engine produces 132kW (180 horsepower) at 3,600rpm and 440Nm (325 lb-ft) at a low 2,000rpm. It is mated to a six-speed automatic or six-speed manual transmission. To lower its NVH (Noise, Vibration and Harshness) level, the Colorado is fitted with a sound deadener around the injectors, revised body mounts, engine mounts, increased chassis rigidity and new cabin mounts. New front brake rotor compound and new suspensions tuned with digressive shocks adds to the lower NVH level. The Colorado features Electric Power Steering (EPS), Traction Control System (TCS), Panic Brake Assist (PBA), Electronic Brake Force Distribution (EBD), Electronic Stability Control (ESC), Hill Descent Control (HDC) and Hill Start Assist (HSA) in addition to the two front airbags, along with a knee airbag for the driver. It also has Lane Departure Warning, Forward Collision Alert, front and rear park assist sensors and Tyre Pressure Monitoring System. Auto rain sensor, auto headlamp, front-park assist and a reverse camera gives better convenience. For connectivity, the Colorado is fitted with Apple Car Play applications and complemented by Siri Eyes Free and voice recognition software. This systems ensures Colorado supports the driver’s lifestyle, allowing you to explore new roads at work and at play. 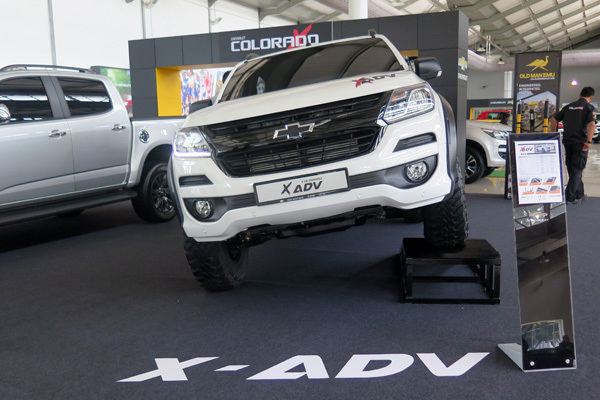 Interested customers who wishes to place a booking on The Colorado X Edition are welcome to enquire further details at all of the authorised Chevrolet showroom nationwide. For more information on Chevrolet, call 1-800-2-CHEVY (24389) or visit www.chevrolet.com.my. Follow Chevrolet Malaysia Facebook and @Chevrolet_MY Twitter and Instagram for the latest updates and offerings of Chevrolet Malaysia.